Hand-drawn batik on cotton damask fabric with Jaman dye (174" x 48"). Partial view shown. Design of pieces may vary. Hand-drawn batik on cotton damask fabric with Jaman dye (180" x 48"). Partial view shown. Design of pieces may vary. Hand-drawn batik on cotton damask fabric with Jaman dye (174" x 48"). Partial view shown. Cotton damask fabric tie-dyed with natural indigo ( 86" x 48"). Partial view shown. Cotton damask fabric cassava starch resist dyed with natural indigo ( 84" x 50"). Partial view shown. Cotton damask fabric tie-dyed with natural indigo (90" x 42"). Partial view shown. Cotton fabric tie-dyed and stitch-resist-dyed with natural indigo. (176" x 48") partial view shown. Cotton damask fabric cassava resist-dyed with natural indigo (90" x 48"). Partial view shown. Cotton damask fabric tie-dyed with natural indigo (57" x 49"). Partial view shown. Batik on rayon/cotton fabric with natural and synthetic dyes. (68" x 24"). Detail view shown. Hand-drawn batik on rayon/cotton fabric with natural and synthetic dyes . (70" x 27"). Detail views shown. Tie-dye on rayon fabric with natural indigo dye. Hand-drawn batik on silk fabric with natural and synthetic dyes . (56" x 13"). Detail view shown. (56" x 11"). Detail view shown. (66" x 14"). Detail view shown. (56" x 10"). Detail view shown. Indigo Tie-dye on cotton T-shirt with natural indigo dye. One of a kind design. Hand-drawn batik on cotton T-shirt with natural indigo dye. One of a kind design. Hand-drawn batik on cotton T-shirte. One of a kind design. Hand-drawn batik on cotton T-shirt. One of a kind design. (52" x 8"). Detail view shown. Nigerian indigo artist Gasali Adeyemo. 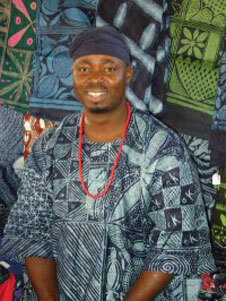 Yoruba adire cloth shown. Santa Fe, NM, 2009. (photo courtesy of the artist). 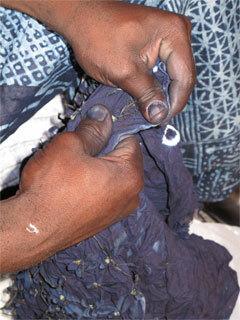 Nigerian indigo artist Gasali Adeyemo removing stitches from indigo tie-dye fabric. Santa Fe, NM, 2011. (Photograph © Anthony Hart Fisher 2011). 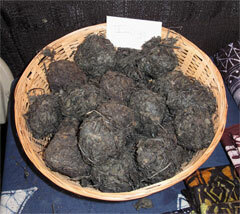 Balls of raw indigo plant, used for dyeing. (Photograph © Anthony Hart Fisher 2011). 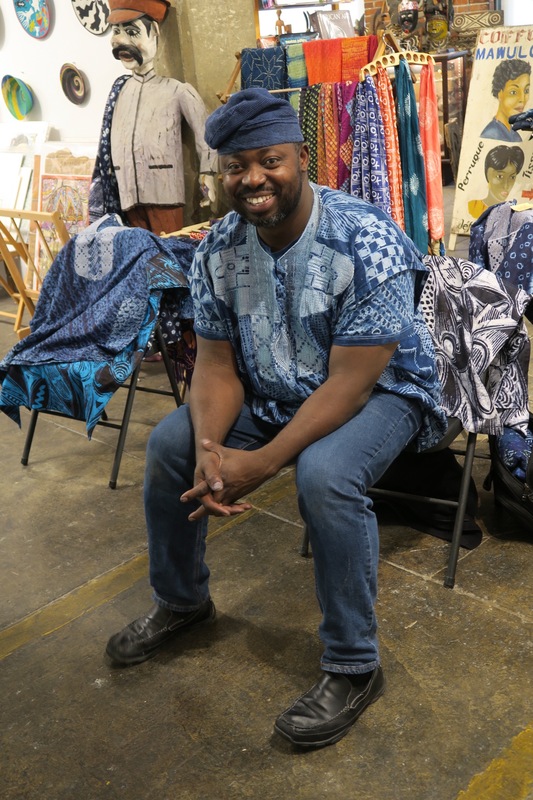 Gasali Adeyemo at Indigo Trunk Show - Indigo Arts Gallery, May 2018.